Perry Enterprises, LLC – specializing in premier concierge property management services for absentee owners. Lorraine Perry is a South Carolina State licensed and insured Property Manager in Charge. As the owner of a small business catering to discerning consumers, Lorraine has trained and supervised employees for over 20 years to deliver service excellence. Her loyal clients praise her impeccable professionalism: consistently dependable, imaginative and resourceful, attentive to detail, trustworthy, with almost an uncanny ability to anticipate not just respond to their needs. 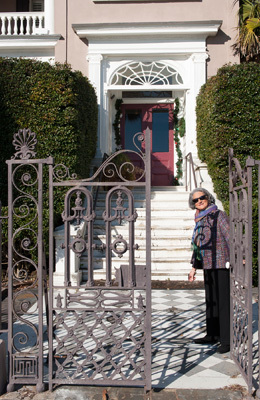 Lorraine has been a resident of Charleston and the owner of an elegant historic home in the downtown area for over 25 years. Her commitment to the community has honed her network of contacts in all phases of business and home maintenance. Her knowledge of the city is eclipsed only by her gracious personal style and high standards. Lorraine Perry is a member of the National Association of Residential Property Managers. She has been active in community organizations as varied as the Historic Charleston Rotary, Preservations Society, Historic Charleston, Low Country Open Land Trust, Historic Ansonborough Neighborhood Association, the Charleston Horticultural Society, Birds of Prey Avian Center, Spoleto USA, Charleston County Public Schools, Charleston Race Week, South Carolina Maritime Foundation, College of Charleston Town and Gown Committee.